I’ve been wanting to try my hand at cauliflower “porridge” for some time now and finally got around to doing it. 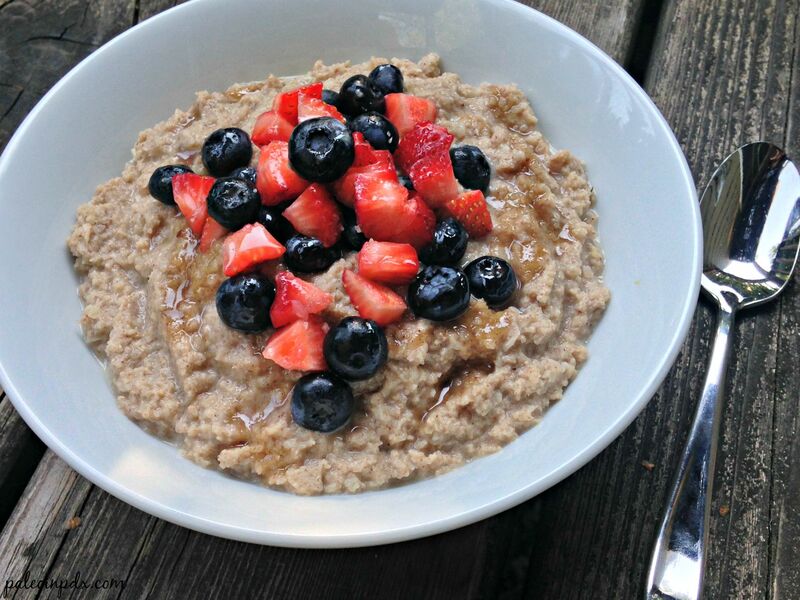 I was surprised how easy it was and how well the porridge held its shape. The texture came out just right, but I think a lot of that can be attributed to the shredded coconut. It adds a bit of thickness and a nice bite. I ate my porridge with fresh strawberries and blueberries mixed in, which was delicious, but you can garnish it with whatever you like. I’ve listed some topping suggestions in the recipe below. This is great hot or cold, and is pretty filling too. Also, if you’re wondering if you can taste the cauliflower — yes, of course you can. It’s not overpowering, in my opinion, but is noticeable. I happen to like cauliflower, so it doesn’t bother me, but if you don’t care for cauliflower, this recipe probably isn’t for you. My husband and I are both fans of this concoction though. Hope you are too! Add the riced cauliflower and shredded coconut to a large saucepan. Then, add the remaining ingredients, EXCEPT for the whisked eggs and raw honey. Stir well over medium-low heat. Bring mixture to a simmer. Cover with lid and continue to simmer 20-25 minutes or until porridge is smooth and creamy. Stir occasionally. Taste and adjust spices as desired. Add raw honey, if using and stir well. Awesome. I used to have this every morning! Back in the day, I did too!